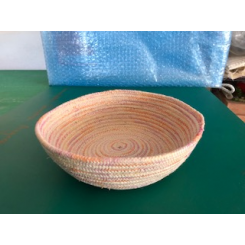 Handcrafted machine sewn bowls that have been hand dyed, wrapped in fabric or sewn with variagated threads. 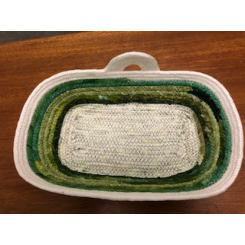 Rectangular Green fabric wrapped bowl .. 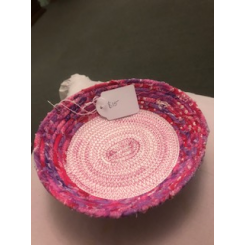 Round machine sewn rope bowl with variagated pink thread (5cm H x 19cm D) .. Shallow machine sewn round bowl wrapped with pink fabric ..